You should always test the hook sharpness after every cast of a rig. 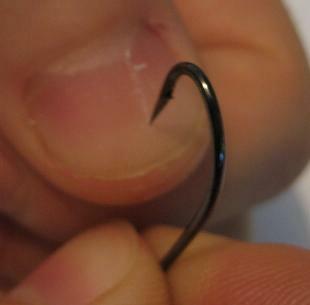 You should also develop a habit to test the sharpness of every new hook from its packet. All new carp hooks will be sharp when first made but the hooks can bump together in the packet during each transit, eventually this can lead to a slight fold of the hook point. 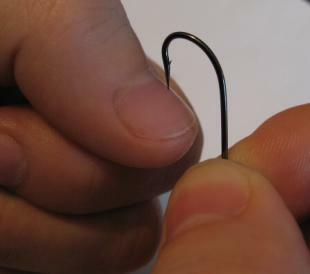 Hold the hook by the shank using your thumb and index finger. Gently rest the hook point on the nail of your other thumb at a slight angle. Don’t press the point into the nail; just basically let it rest under its own weight. Now very gently try to pull the hook down to the tip of the nail. If the carp hook slips across the nail then it’s not sharp enough. If it grips well it’s sharp enough to catch carp. After every cast you should do the above test. Carp Hooks are so needle sharp that the point can be easily damaged. The hook will very often catch on some material during the retrieve. Gravel, sand, wood, weed, etc can cause slight damage to the point. 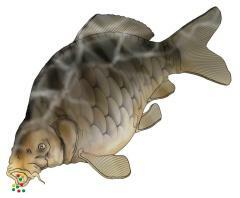 Learn from the mistakes of others and never fish for carp using blunt hooks. A few top carp anglers even replace the hook after every cast, just in case! Big carp are hard to catch at the best of times so you don’t want to create a reason to lose a potential monster just because you couldn't be arsed to do a 20 second test on the hook before casting the rig. Carp Hook Patterns - What they for? Sharp Hook Always Produce Best Results!